The above Super Hits were pulled last weekend from The BEST CASES in The Hobby at The LOWEST PRICE in The Galaxy. It's BIGGER than Black Friday. It's BIGGER than Cyber Monday. It's BIGGER than.......The Big Dipper. The Black Friday AFTER-PARTY will give our customers 12-Days of GREAT DEALS, LOW, LOW, LOW Prices, FREE PACKS, Prizes & Surprises and MORE. Saturday, December 9th is NATIONAL HOBBY SHOP DAY. This event is so HUGE it starts on FRIDAY DECEMBER 8th at Sports Cards Plus. Check this out: For the next twelve days (through December 9th) you get one free drawing ticket for each $100 spent at Sports Cards Plus. 6. Your choice of one: A Stephen Curry (Yellow Jersey Variation), Dak Prescott or Kawhi Leonard McFarlane Figure. Winners will be announced on Monday, December 11th. 1. Beckett Grading will do RAW CARD REVIEW (in-store grading while you wait) on Friday, December 8th from 11 a.m. to 4 p.m. . See Beckett's website for grading fees. The more you grade the cheaper the price per card. 2. Looking for some extra Christmas Cash? Adam Rowe, owner of Breakers Rowe will be in our store (Friday, Dec 8th from 12 to 5 p.m.) to buy valuable cards ($50 or more) for his next addition of BREAKERS ROWE Products. --- FREE Panini Promotional Pack with each Panini Box ($69 or more) purchased. --- FREE Topps Promotional Pack with each Topps Box ($69 or more) purchased. --- FREE Upper Deck Hockey Promotional Pack with each UD Hockey Box purchased. 4. 2017 Panini Rookies & Stars Football arrives Monday afternoon. 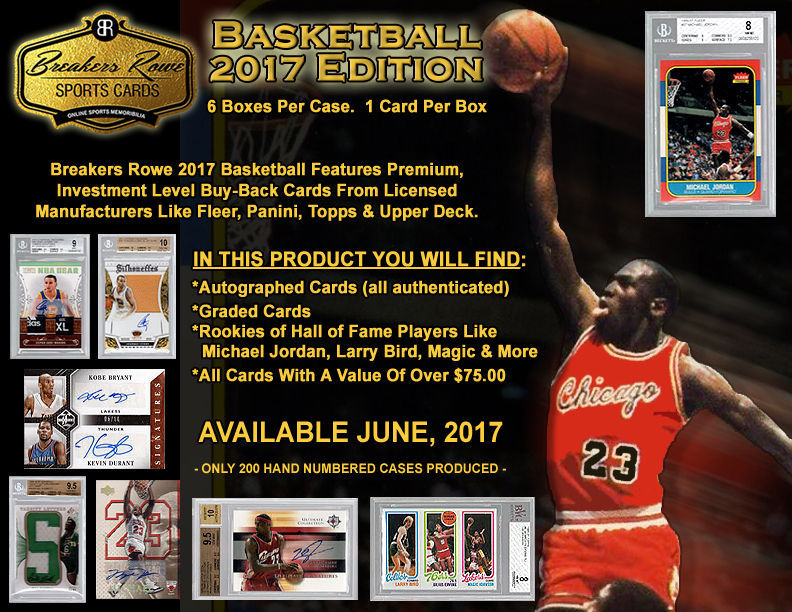 Each Box ($94) delivers 2 Autos, 2 Memorabilia, 5 serial numbered cards and 11 inserts. 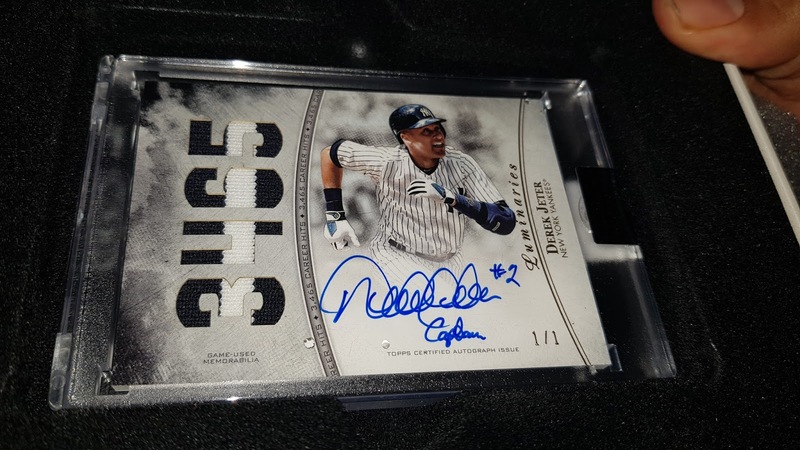 Rookies & Stars has an extremely low Hobby case production run. RARE. Get One FREE Panini Promotion Pack with each box purchased. Friday and Saturday (while supplies last) Sports Cards Plus customers attending our 2-Day National Hobby Shop Day Promotion get FREE snacks and refreshments in our store. 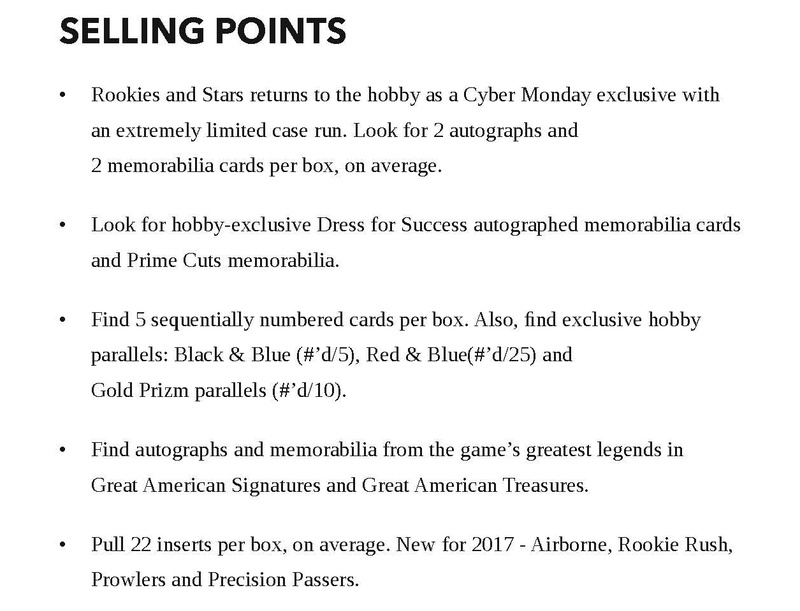 More information to follow as we approach National Hobby Shop Day.